Shopping for pants for boys is hard. Either they are too slim or too loose or too short or too long! While pants are becoming more innovative with internal tightening features, there really wasn't any way to shorten pants without hemming. Until now. I had the absolutely joy of trying out a sample of ObyRollz. These very fashionable accessories make shortening a pair of pants very easy. They come in adorable styles, and you actually get two styles in one, since they are reversible! Using these were very simple. They came with instructions, and I had a "shortened" pair of pants for my 3-year-old Manny in minutes! I will say that the first time using these, they were a bit stiff, and it took a little practice to make the roll less bulky. I would also use their recommendations to go with the smaller size for skinny jeans. My son is wearing a 2T, and technically a Large size of the ObyRollz, but his pants were on the narrow side. I think we could have gone with either size. He LOVED that his pants didn't drag on the ground like they usually do. I like that I didn't have to worry about the safety of him running across hardwood floors with his pants over his feet. I can't tell you how many times he has slipped and hurt himself with pant legs that seem to creep down over time. There are two ways to wear these (shortening 3 inches or shortening them less.) I liked to shorten them more, just to give my boy room to play. I really like all of the designs available. My favorite is the one we received, with the hounds-tooth on one side and the book print on the other. So classy! Manny wearing "Marcus" hand-me-downs with success! You can get your ObyRollz in various sizes and style for just $16.99. 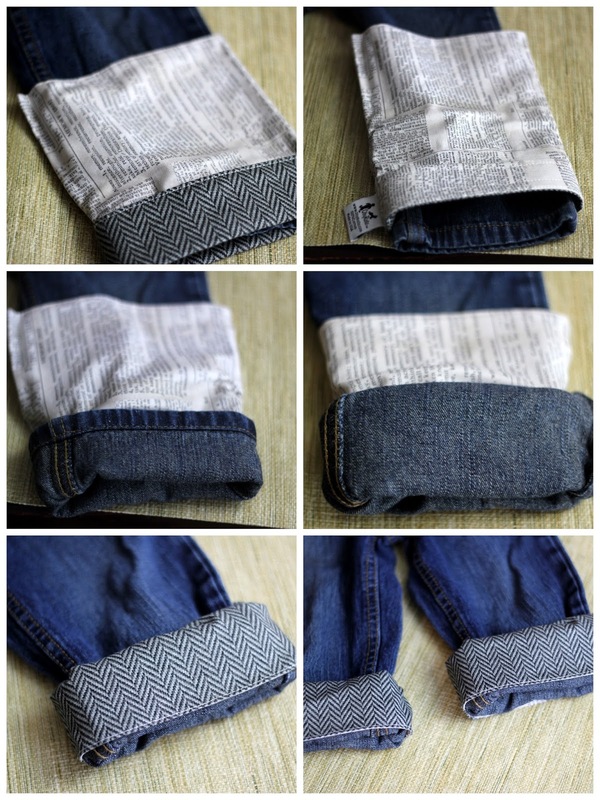 If it saves just one pair of pants from dragging and fraying at the bottom, I think it's worth it! And they make a plain pair of sweats or jeans look like they came from a boutique! It's a very affordable way to upgrade plain pants. *Samples received for review. Opinions are my own.